A STEM lab, global literacy, guidance lessons, and an enrichment program provide our K-6 students the skills they need to go on to success in junior high and beyond! Our progressive STEM program, K-12 world language program, and dynamic curriculum set the stage for taking AP and Dual Credit Courses while in HS. Congratulations to three Villa seniors who have signed to continue their athletic careers in college. Villa encourages participation in multiple sports with a no-cut policy at all grade levels. Students at Villa consistently score above local, state, and national averages on standardized tests. These results set the stage for future achievements in college and beyond. Senior Ben Zalla Scores Big! Perfect score of 36 on the ACT, 1000 career points in basketball, National Merit Finalist, and winner of the Cardboard Boat Regatta! Click here for more. Congratulations Hannah: National Merit Finalist, Governor's Scholar, accomplished cellist, and a member of the Villa State-Bound Academic Team. Students embrace the Catholic, Benedictine values of scholarship, service, hospitality, and stewardship. Explore our college-like campus and discover our Villa values. Call today to schedule a personal tour. Celebrating an average of $200,000 in scholarship offers per student. Click here for more. 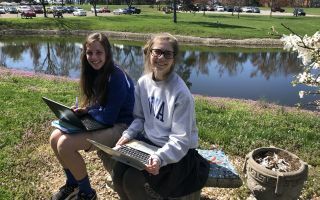 Villa Madonna Academy, a co-ed, private, Catholic K-12 school in Northern Kentucky, welcomes students from all corners of the tri-state and around the world. Visit the beautiful campus and discover a rare place where students are engaged, challenged, and involved. At Villa, there is no one-size-fits-all approach to anything. Villa's teachers encourage active, collaborative, and investigative work to make lessons more meaningful and memorable. Villa's community emphasizes hospitality, respect, and service. All are welcome and all are challenged to meet their fullest potential. To schedule a personal tour, please contact Ms. Baugh at 859-331-6333 ext. 139 or email jbaugh@villamadonna.net. Click here for events and more.